Another busy day at the festival! And my purse is quite a bit lighter! 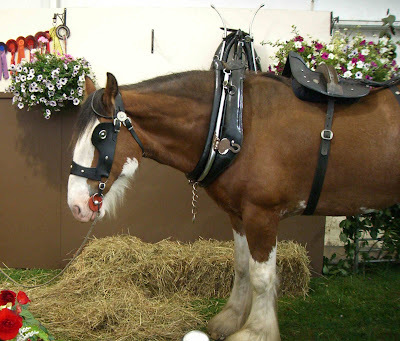 First I have to show you the lovely clydesdale horse that was delighting all the children. Isn't he a beauty? A bottle of raspberry wine from Slim at Cairn O' Mohr Winery. A rather mad chap and so is the wine! I haven't opened the bottle yet, but I know of the delights held within! I have many happy memories of this wine! The first was of a student night, to a local pub. Cairn O' Mohr, had a free wine tasting. They must have been mad! Students! Free Wine! Oh Dear! I am lucky to remember anything at all about this night! The Cairn O' Mohr Winery is situated in a farm in Errol, very near Dundee, where they make wine from the local berries. They use strawberries, raspberries, brambles, elderberries, elderflowers and oak leaves! My next purchase was a very expensive bottle of 12 year old, oak matured balsamic vinegar (don't tell Graham!) from the The Gift of Oil. It is really rich and sticky! I was actually browsing at the cheese stand next door, when the waft of balsamic vinegar assailed my senses! The stall holder saw that it had me in it's thrall and persuaded me to try some. Well I was lost then, wasn't I? That is my card being swiped! I stopped at the supermarket on the way home to buy some crusty bread and once more I curled up on the couch exhausted. This time with cubes of bread to dip in a little bowl of balsamic heaven! The horse does look nice. Here in Toronto the police have a mounted division and it is alway nice to see the police riding their horses down the street. I have not tried any really old balsamic vinegar. I will have to keep an eye out for some. That must be a great sight to see! Our police are either walking the beat (don't see them very often) or in cars! What a difference in an aged vinegar. It is thicker in consistency and has a must stronger flavour. Delicious! What a nice festival. I've always wanted to visit Scotland and will have to do it one day soon. This is going to sound silly, but I love Scottish accents. I could listen to Scottish people talk all day long. Wine and olive oil. Those are the 2 booths you would find my card being swiped also! Did you just dip your bread right into the balsamic? Did you purchase any of the olive oil? I just adore real fruity olive oil with a hunk of bread. I bet that balsamic would be yummy with some fresh strawberries! You are making me so hungry and I just had lunch! Hi Urban Vegan, Some accents I like more than others. There is a man on a gardening programme (the Beechgrove Garden)called Jim McColl and he has a lovely comforting voice with a soft burr. He is from ayrshire, so that is my favourite! Hi Deb, I didn't buy any oil, but I bet it would have been good too! I have a bit of a stockpile of olive oil in my pantry just now! I just dunked the chunks of bread straight in the balsamic, as is often done with a good peppery olive oil. It was heavenly! Hi Lisa, The festival was a pleasure, even if I was weary at the end of each day! I was there for 2 days.